Watkins, S., Curry, N., & Mynard, J. (2014). Piloting and evaluating a redesigned self-directed learning curriculum. Studies in Self-Access Learning Journal, 5(1), 58-78. 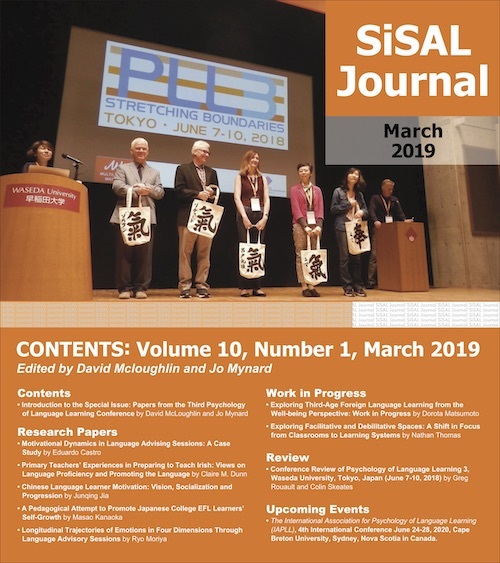 In the fourth installment of the column following the self-directed learning curriculum development project at Kanda University of International Studies, Japan, Satoko Watkins, Neil Curry and Jo Mynard detail the process of conducting a pilot of a possible self-directed learning curriculum for freshmen students, that would meet the needs and principles established in the previous two installments. This pilot represents quite a shift for the learning advisors (LAs), as it would bring what has up until now been a largely self-study course into the mainstream classroom environment, taught by LAs. The installment offers an insight into the strengths and potential weaknesses of such a course, and how students responded to it. Format refers to how the curriculum would actually be delivered to the students i.e. as an optional outside class self-study course, as classroom-based content etc. and was the first item that needed to be decided. It was decided that the curriculum should be piloted with one Freshman English class over the course of the first semester, which involved firstly compulsory in-class input sessions taught by LAs, and secondly an optional outside class self-study supported by LAs. There could have been other delivery formats; piloting a new optional learner training course which would replace the existing First Steps Module (FSM), asking teachers to pilot the material in class without the assistance of LAs, or offering a series of optional workshops to instruct students on self-access learning, but classroom delivery by LAs was chosen for three main reasons. Firstly, offering SALC curriculum content during class time would be a more practical way to reach all freshman English students in the future, as opposed to offering only an optional course. Secondly, this format enabled the LA team to adhere to the established principles of format and presentation for a self-directed language learning course (see appendix A). For instance, the principles suggest ensuring that the course caters for different learning styles and students’ preferences, the input and experimental learning are balanced, and the students are provided with opportunities to interact with peers. These principles were established based upon the results of the environment analysis (see Thornton, 2013), the needs analysis (see Takahashi et al., 2013), focus groups (Hasegawa & Thornton, forthcoming), consulting literature, and established learning outcomes in the previous stage of the curriculum design project (see Lammons, 2013). In particular, the format allowed for numerous opportunities for students to work with peers and for different kinds of reflection and interaction (written, face to face, peer, etc.). Finally, as this was part of a research project, the LAs could work closely with the students and the teacher in order to make observations and gather information that would be important for later decision making. Thus, the pilot course outline was developed as identified in Table 1 and consisted of two phases. First, there was a compulsory phase where the Core Course Content (CCC) would provide the self-directed learning (SDL) training that was identified as being crucial during the needs analysis phase of the project (see Takahashi et al., 2013). The CCC was followed by an optional period where students could implement their individualised SDL plans. This second phase was optional and took place outside the classroom because of the LA team’s belief in learner autonomy, and the idea that students need to have some choice in and control over their own learning. It was thought that students who completed the initial CCC would have the tools with which to create an SDL plan anytime in the future. The CCC material used was a mixture of new and existing materials; many of the activities were similar to those that had featured in previous SALC modules, workshops and courses. However, the materials selected were deemed to adequately introduce the learning outcomes (see Takahashi et al., 2013 for details of the learning outcomes). In addition, every attempt was made to ensure that the content adhered to the established principles for content and sequencing for self-directed language learning courses (see appendix A for details). For example, these principles assured the content coverage, opportunities for personalisation, and learnability of the materials. Optional Course Content (OCC) is content which was deemed important, but best introduced organically within the CCC and also made available in a more tailored way to students when relevant, rather than introduced to all module or course-takers at the same time (Lammons, 2013). The two OCC concepts were “Time Management” and “Affective Strategies” and these were introduced to the students through two extra classroom workshops in the second semester at the request of the teacher. In addition, these concepts were introduced to individual students at appropriate times during the piloting phase. The approach to assessment was guided by the principles for the self-directed language-learning course (see appendix A for details). These ensure that the students are assessed on the core learning outcomes and not language proficiency, that the assessment is consistent between LAs, and that the assessment procedure is practical and realistic for LAs. For the pilot, the students’ work during the first four content sections was not assessed as these were input sessions, and students were not required to provide the evidence of learning at this point; however, students had to complete a minimal amount of work each week in order to receive the extra credits for the course. For those students who had continued with the implementation of the learning plan, additional credits were given based on a simple descriptive rubric relating to the learning outcomes, indicating that students had “approached the standard”, “met the standard”or“exceeded the standard”in each of the learning outcome areas (see Takahashi et al., 2013 (appendix) for details). Further aspects of assessment will be discussed in the next installment of this column, which includes an overview of assessment of SDL, previous assessment tools and methods used, and how these have contributed to the evolution of the assessment procedures of the SALC SDL curriculum. A new advanced-track Freshman English curriculum was being implemented in 2013, so the team took the opportunity to pilot the material in one class of this new course. One Freshman English teacher kindly agreed to participate and made four 90-minute class periods available in May and June 2013. The pilot class consisted of 20 students who all agreed to participate in thestudy. 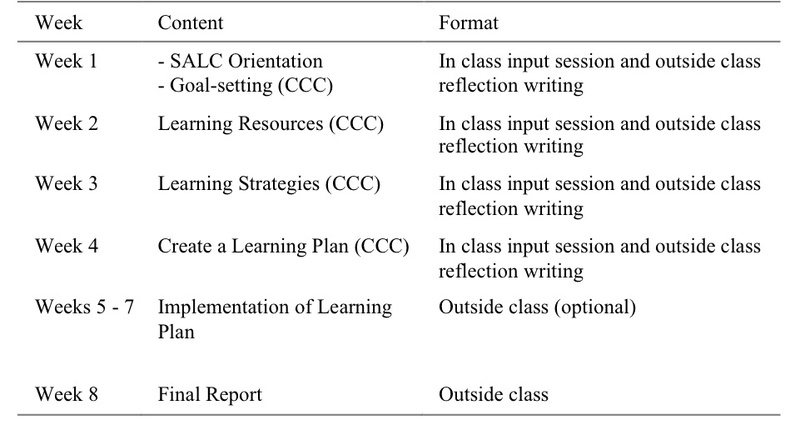 Three LAs (the authors of this paper) used the four class periods to introduce the pilot versions of the CCC activities during the four weeks. Even though this advantageous ratio of LAs to students could not be sustained during a full implementation version (which needs to reach around 900 students), there were benefits to having three LAs involved in the piloting. The main purpose was so that the implementation phase could be observed by three researchers, which proved useful for subsequent evaluation of the pilot. The class was split into three groups of six or seven students with one advisor assuming responsibility for that same group for the remainder of the course. This enabled the LAs to establish close relationships with those students and to become more aware of their particular needs, goals, strengths and weaknesses in order to observe more easily whether the activities were meeting the students’ needs. 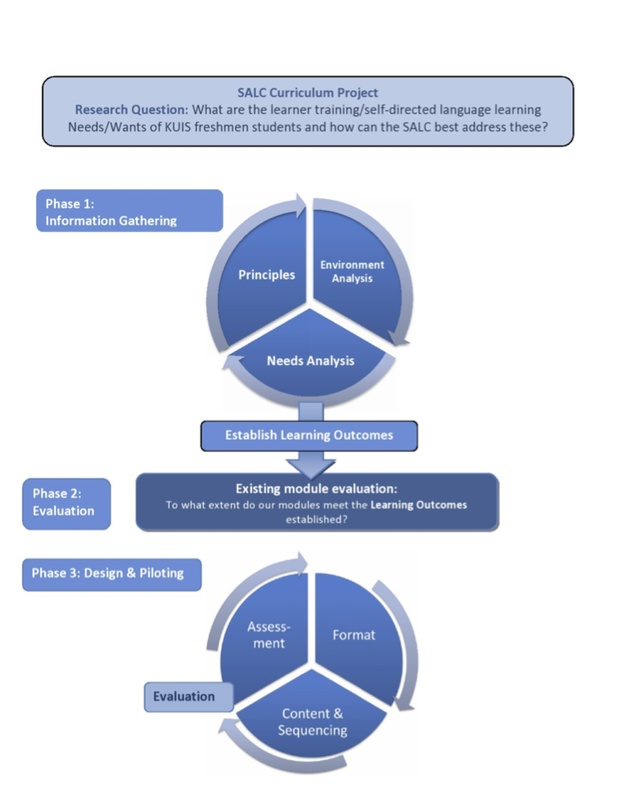 The pilot phase (Phase 3 in the curriculum modification process shown in Figure 1) was evaluated using various tools that feature in Nation and Macalister’s (2010) “Focus and tools for evaluation of teaching and learning”(p. 129). Five focus areas were chosen from the original list and six tools were identified as the most relevant to the context (shown in Table 2). In the interests of space, three tools (student self-evaluation, student survey, and course evaluation checklist) are discussed below as these have covered all five focus areas. At the beginning of the pilot phase, students completed a short self-evaluation questionnaire for the purpose of initially evaluating their perceived knowledge of the CCC and subsequently their amount of learning (see appendix B for the questionnaire and the results). This questionnaire comprised two parts: evaluation of existing knowledge of the SALC and LAs, and evaluation of students’previous knowledge and experience of the CCC areas. It also served to raise awareness among the students of the types of skills involved in SDL and reminded students of the opportunities for learning outside the classroom. As a result, it was found that the majority of students (around 70%), although being somewhat familiar with the SALC, were not aware of the CCC areas. One of the ways in which to gauge whether the content delivery had been successful was to administer the questionnaire again in week 4 at the end of the input sessions to provide a comparison. The results showed that around 80% of students stated that they knew how to utilise the skills, compared to about the same number not knowing previously. 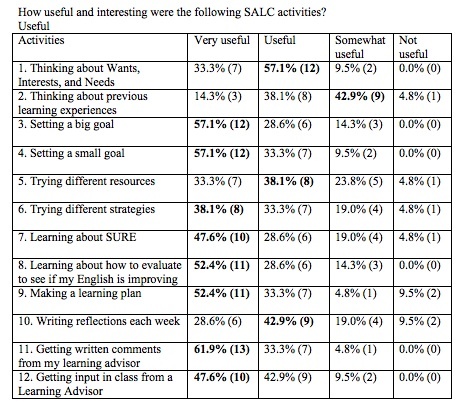 How useful and interesting did students perceive the SALC activities to be? What were studentviews on the activities themselves? Why did students choose / choose not to implement their learning plans? 1) How useful and interesting did the students perceive the SALC activities to be? 2) What were students’ views on the activities themselves? In the second section, the students were asked to rate 17 statements related to the SALC activities bylevel of difficulty and amount of time spent, preference, andeffectiveness and learning gains. Four scales were used: “Strongly agree”, “Agree”, “Disagree”, and “Strongly disagree”. 3) Why did students choose / choose not to implement their learning plans? 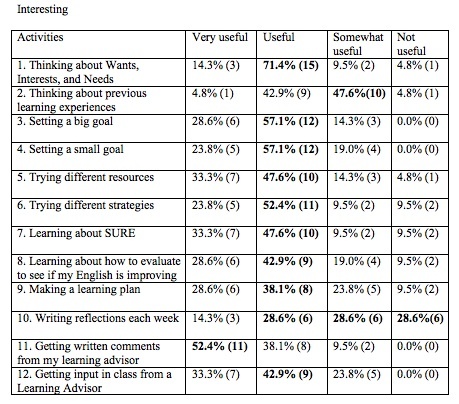 In the last section, 85% said they chose to implement their learning plans and 15% chose not to. Those who decided to continue found their learning plan useful for achieving their language learning goals and believed that the experience would be beneficial. Those who decided not to implement their plans expressed their desire to continue, but explained that their schedule would not allow them to do so. Evaluation of the pilot design was achieved using the same checklists from Phase 2 when it was used to evaluate the existing First Steps Module (see Lammons, 2013 for details of how the checklists were created). The CCC (orientation and goal-setting, learning resources, learning strategies, learning plan, implementation of learning plan) were evaluated separately using the checklists. This was in order to ensure that all content fulfilled all principles, for instance whether socio-effective, cognitive and metacognitive skills were covered, if students were able to utilise prior knowledge and skills, and whether the amount of content was suitable in terms of workload. The evaluation revealed that the course generally satisfied all principles, but somepoints need to be addressed as identified in Table 3. Based on the evaluation analysis of the five foci, it is fair to say that the pilot course produced positive results and provided both students and LAs with valuable experiences. Although some conditions were privileged in this pilot course (such as having three LAs in one class room, working with a teacher who values SDL skills, and advanced level students), it was an opportunity to see how the curriculum might work in a different format. After reviewing the obtained results, some changes need to be made in order to adequately address students’ needs. Particularly, the fact that there were many students who were not able to continue SDL training with LAs due to time constraints, despite their own willingness, indicates that further collaboration is necessary with freshman English teachers and the university administration, in order to increase opportunities to do so. What is clear, based on the research, is that in-class SDL training gave all of the students the opportunity to learn crucial SDL skills. Further possibilities for integration of SALC SDL training within freshman English courses still needs discussion not only in the SALC team but also with teachers and course coordinators. Through the pilot experience, the SALC team has developed a better understanding of what a successful program could look like, and will continue searching the ways to promote and develop SDL skills among students across the wider university community. Neil Curry has been teaching in Japan for 8 years and is currently a learning advisor at Kanda University of International Studies. His primary interests are in Foreign Language Anxiety and language advising. At various stages, the following people have been key members of the project described in this case study: Neil Curry, Yuki Hasegawa, Elizabeth Lammons, Tanya McCarthy, Brian R. Morrison, Jo Mynard, Diego Navarro, Junko Noguchi, Akiyuki Sakai, Keiko Takahashi, Katherine Thornton, Satoko Watkins, and Atsumi Yamaguchi. Hasegawa, Y., & Thornton, K. (Forthcoming). Examining the perspectives of students on a self-directed learning module. In J. Mynard & C. Ludwig (Eds. ), Autonomy in language learning: Tools, tasks and environments. Faversham, UK: IATEFL. Mynard, J., Takahashi, K., & Yamaguchi, A. (2011). Learning how to learn / Sophomore modules group report. Studies in Linguistics and Language Teaching, 22, 260-262. Nation, I.S.P., & Macalister, J. (2010). Language curriculum design. London, UK: Routledge. 2. Students should be free to choose their own R&M within the context of the course. 7. Learners should have optional opportunities to continue implementing a plan after a course has been completed. 10. Learners should be provided with opportunities to interact with other learners and have opportunities to share and learn from each other, in all courses, either face-to-face or online (or both). 12. Some bilingual support for technical terms should be made available for students who want to use it (glossary etc). 1. Students should learn the following four different kinds of skills to optimise their learning. 2. Students should have a clear understanding of the aims and objectives of any course at the beginning (for example by sharing Learning Plans, as well as explaining them in course literature/orientation sessions). 3. Students should spend some time exploring and raising their awareness before narrowing down their focus and practicing taking control of their learning. 6. Learners should have the opportunity to implement further optional learning plans outside class. 12. Students should reflect on each stage of the learning process. 13. Students should receive guidance and training about how to reflect/monitor their work. 8. Assessment should be consistent between advisors (using grading rubrics, doing norming sessions, using consistent approaches to penalties for missed work). 11. Grading procedures (rubrics, learning plans etc.) should be shared with students at the start of the course or during the orientation, and made clear to them with as much detail as possible. Result of Student Survey Section One: How useful and interesting did the students perceived the SALC activities to be?